The 'Standard Model' of particle physics successfully describes the smallest constituents of matter. But the model has its limitations – it does not explain the dark matter of the universe. Christoffer Petersson, a research scientist at Chalmers University of Technology, has found a solution. His theories are now being tested at the particle physics laboratory CERN. Physicists describe the smallest constituents of nature – elementary particles and forces acting between them using a set of theories known as "the Standard Model". This model was developed in the 1970s and has been very successful, particularly in predicting the existence of undiscovered particles. "It's a dream for a theorist in particle physics. LHC is the only place where the model can be tested. It's even nicer that two independent experiments are going to do it," says Christoffer Petersson. In the first studies the volume of data was unfortunately too small for it to be possible to either confirm or reject Petersson's model. "But we are already in full swing with new analyses in which we are testing his model in other ways and with more data. We congratulate Christoffer Petersson for having done an important job," says Zeynap Demiragli at the CMS experiment at CERN. After being closed down for a time for an upgrade, LHC will start up again in the spring of 2015. With higher energies in the accelerator, the experiments will finally gather sufficient data to evaluate Petersson's model properly. He is on tenterhooks awaiting the results. "If the model is found to fit, it would completely change our understanding of the fundamental building blocks of nature. If not, just the fact that they are willing to test my model at CERN is great," he says. Who would have expected that dark matter interacts with (one of) the Higgs particle(s)? Oh, wait. That is obvious (at least, assuming that the Higgs 'gives' dark matter its mass is one obvious possibility, any different hypothesis would require many more assumptions, so the Rule of Parsimony comes into play, I think). It is good to know that LHC actually has Physics to do (in the range of energy it is capable of) and questions to answer. Otherwise, firing it up again would be a real boondoggle. The basic question is: will they find any new Physics in the LHC's energy range? This is about one possibility. Wonder if the 'good mr jalmy is chinese agent provacateur or just a luddite, or maybe a "useful fool" as told in the book: "Masters of Deceit"? Be nice if he was on the TSA's 'no fly' list. With higher energies in the accelerator, the experiments will finally gather sufficient data to evaluate Petersson's model properly. He is on tenterhooks awaiting the results. tenterhooks? I don't think that term has been used since the 18th century! Is this some sort of "slight of head?" Such BS. I can't believe people fund this crap. This model is stupid for the same reason every other dark matter model is stupid. If it were right, there would be dark matter, but where is it? Where the f is the dark matter? It's nowhere. ... Put that sh^t on everything. We fund seti, which is a complete logical fallacy (We couldn't even detect an advanced civilization in the next star system over) and yet valuable scientific progress comes of it. It is the same with dark matter/energy. The lengths and ingenuity that scientists and physicists go to prove or narrow dark matter ranges help inform us about our universe in other ways and construct new ways to probe it for other data. @jalmy Just take your lack of knowledge and understanding outburst to a Kardashian article or something. I hope everybody posting is aware this is simply an artists drawing. I also hope they are aware the evidence of the Higgs is shaky in the first place. Has it been determined whether this particle (the one that was found) creates mass or not? It would seem that that is the most important next step. What I find troubling is that the news don't really clarify that the 2012 Higgs Boson discovery has not been confirmed yet. 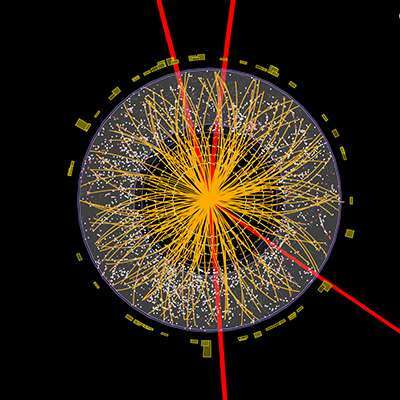 It is not yet proven that what was found is a Higgs Boson without a spin—spin-0, scalar. Basically, what was found is a new Higgs Boson particle —there are many— that exhibited similarities with the sought after Higgs Boson Particle, aka the God Particle, which is the Particle Physics Standard Model Higgs Boson Particle, scalar, spin-0—without a spin. The data that CERN has collected since their last Higgs Boson discovery back in 2012 is massive and requires up to four years of study and analysis. And, to make things worse, they might end up needing to redo the experiment and collect data again. They have already determined that the Hadron Collider did not have enough power to simulate enough of the actual events fractions of a second after the Big Bang. That's why it was shutdown and the power capacity upgrades took place. Also, the "Dark Matter Hypothesis" is on the brink of obsoleteness. The Scientific Community is taking a final stab at encountering WIMPs —Weakly Interacting Massive Particles— which are hypothesized to make up Dark Matter. If scientists do not encounter WIMPs this time around, they will move on to other explanations. Also, the "Neutrino Hypothesis" —neutrino & anti-neutrino being the same particle— is facing a similar fate. The Quantum Field Theory and the Particle Physics Standard Model are on shaky grounds without the Higgs Boson Particle (spin-0, scalar,) Dark Matter WIMPs—Weakly Interacting Massive Particles, and Neutrinos—neutrino & anti-neutrino being the same particle. What I'm excited about formalizing what dark matter is exactly. Right now we only understand it as a mass, that can't be the only property it has, it must have deeper characteristics and who knows what value it may have. But it does have mass and that means it has energy, I know I sound like a fringe conspiracy guy, but all energy is interchangeable, maybe dark matter could have very real uses as we uncover its properties. Oh thanks very much but I thought SUSY was a female name. Hell, I got it wrong again! Maybe it's just me, but doesn't that sound like that C. P.'s paper is coincidental? And of all the people at CERN to be congratulated, C. P. is chosen. ???????
" But the model has its limitations – it does not explain the dark matter of the universe." Nonsense, DM can not be WIMPs. This is an epicycle to a failed theory. Welp, since we're going with imaginary stuff, I propose a theory whereby the Higgs Boson decays into candy and popcorn . . .
Yah. I had to look up that one, too. The lengths and ingenuity that scientists and physicists go to prove or narrow dark matter ranges help inform us about our universe in other ways and construct new ways to probe it for other data. And who knows...maybe they'll get lucky with Petterson's theory. It is not yet proven that what was found is a Higgs Boson without a spin—spin-0, scalar. The theories that include several Higgs bosons (with various spins) are still Higgs bosons. Has it been determined whether this particle (the one that was found) creates mass or not? No, but it's exactly in the 'right place'. The chances that it's something else (or a fluke in the data) are pretty slim. Why has dark matter been postulated? Was it a result of naked empirical observation? Nope. The laughable thing is that general relativity is so divergent from observation that they had to break out the con found in the Emperors New Clothes. Because something is there that affects everything else. We don't know exactly what it is, but something is there. We've given that something the label "dark matter". If the label bothers you, feel free to use one of your own. Another fake assumptions. Keep making up stories and ideas that does not have any real bearing. As of this moment no one has clear understanding of what Dark Matter is and hinting Higgs particle transforms into Dark Matter particle is a BIG BOGUS concept! BOGUS, I say again, BOGUS, FAKE insinuation. Come on, feed the people what they want to hear and what they want to swallow to get the much desired attention and interest under fake mindsets. http://www.svemir...ing.html article: 6 ... The Creation continued on the eighth day .. and 17 ... Are we blind or we do not want to see the dark matter! Sad attempt at a red herring. Whether there is something there or not remains to be seen. The reason some people believe that there is "something" there is because relativity requires it . "Albert Einstein was the first person to realize that empty space is not nothing.Space has amazing properties, many of which are just beginning to be understood. The first property that Einstein discovered is that it is possible for more space to come into existence. " That Higgs particle can be crossed referenced to living organisms in the body..mostly the stomach and intestines. They are parasites for a reason, and guess what they can perform materialization's. Quite frankly "chit" is a miracle in itself. Now reflected into space I'd say that parasite(tick) alway's does it's job. Such BS. I can't believe people fund this crap. This model is stupid for the same reason every other dark matter model is stupid. If it were right, there would be dark matter, but where is it? Where the f is the dark matter? It's nowhere. No model you will ever make will make sense of something that makes up 80% of all matter yet we cannot find a single molecule of it. Or see it, smell it, touch, taste, anything. Apparently dark matter is the new condiment. Put that sh^t on everything. Lets get you on plane to CERN! You know much more than every other physicist on earth after all! The last time I looked, the "Standard Model" had labeled 'Higgs' as a boson. The standard model is limited in that it 'has no model' of the composition of any of the sub-atomic particles in the tables it portrays AND it has no viable explanation of something called the Photon. In a nutshell, infinitely tiny "Massless Black Holes" in the center of every Electron, Proton, Neutron.. etc are CREATED and SUSTAINED by either a pair or trio of orbiting Photons in the same manner as binary stars produce a 'massless center of gravity' in the space between the two stars. The 'Higgs Boson' is merely a "Massless Black Hole". Homework shows the density of the "Massless Black Hole" in every Electron is 7 Orders of magnitude greater than the Sun. Once the "Massless Black Hole" is understood, the Galaxy may use one. The Electron is a binary Soliton composed of TWO Photons orbiting a "Massless Black Hole" in the center of orbital rotation of TWO high energy Photons. E=TWO*(MC*C/2). Simple trick. So many of the proposed "New Theories" in physics are really no more than Crackpot notions. This is another one. Dark matter is only postulated as a particle because nobody has any other ideas, time will show the measurements are real but are not due to a "new" particle, i.e. CDM does not exist. And Higgs, perhaps just a proton in an alpha excited state, 938 x 137 ~ 128.5GeV. mooster 75, you are correct, lets call it "Dark Effect", which does not imply its matter, and only indicates current ignorance. A prediction: The CDM effect is 5.15 times that of baryonic matter assumed using Newton's gravity relation. But of course we know that relation is invalid as gravity acts via curved metrics, not "mass" in observer space-time. Observer space-time is obviously not highly curved so gravity is not an effect in that space. Once gravity is fully understood the CDM effect will go away. The standard model is limited in that it 'has no model' of the composition of any of the sub-atomic particles in the tables it portrays AND it has no viable explanation of something called the Photon. Sub atomic particles aren't "made" of anything, they are about as simple of a thing possible, just charges with angular momentum and some mass. There's no reason to describe them as made of anything simpler because there is nothing observed implying that they have components. The standard model also has a perfect explanation of the photon, it is electromagnetic radiation. What does that mean? It means energy is radiated away from electrons in the form of photons and electrons can absorb energy in the form of photons. Photosynthesis works by absorbing photons which in turn power up electrons to drive the chemistry in plants. Yeah I don't know what he's talking about lol. But I don't actually care if I taught him anything or not, they could be a 12 year old kid who just discovered the endless roads of Wikipedia and doesn't really know what they are talking about, or some conspiracy guy who will just get mad about Einstein because they are insane and think they are competing with him. It's really I don't want someone reading their stuff and thinking they're right cause it sounds cool. "WOAH WHAT IF EVERYTHING WAS THESE SUPER COOL MASSLESS BLACK HOLES? Now just let me just screw up some algebra and my new theory will be complete for some reason"
Dark matter clumps together, we can map it to form images of it's shape, it is not a defuse effect everywhere across the universe like the dark energy phenomenon. Dark matter is a localized effect that creates distinct and measurable structure which means it has mass. The fact that it doesn't appear to interact with electromagnetism isn't a problem, not all fundamental forces interact directly. But there is some evidence that it might actually albeit weakly by decaying into photons, time will tell, but I'm sure you'll just ignore it anyways. Just Google dark matter and go to the images to see some maps of the distribution of dark mass. Dark Matter halos do not exist around Elliptical galaxies, only Spirals. Elliptical galaxies create almost all the gravitational lensing we OBSERVE throughout the universe, by contrast Spiral galaxies DO NOT create gravitational lensing. So, if there is all this clumpy DM holding Spirals together surrounded by a so-called DM halo as these Spirals rotate in excess of 200 km/s, why then don't Spirals create gravitational lensing? Must be a lot of missing gravity here compared to Elliptical galaxies rotating at a mere 2 km/s (by the way, this is observable evidence). I'm not sure if they have dark matter in a defined halo explicitly, the giant elliptical galaxies your referring too are formed from the mergers of spiral galaxies so they do still have plenty of dark matter in them. A quarter of the universe is dark matter, there is no where you won't find it. Most lenses are created from large clusters of galaxies, not just one, and sometimes there aren't any galaxies at all, just dark matter. ...or for that matter even from oher Ellipticals, so there's no criteria here for DM arising only from Spirals. Only Ellipticals create lensing, this is observational, the scientific method. No you are, I'm referring to the observational evidence. You're the one contorting observational evidence of the disparities we observe between galaxy types. I know, I can follow every Differential Equation in Einstein's GR, now take & apply it to lensing created by Elliptical galaxies versus lack of lensing created by Spirals. "...Spiral galaxies DO NOT create gravitational lensing." Benni, I'm referring to observational evidence too. You choose to ignore it. What does that say about you? .....and you continue to cherry pick your DM narrative.......99.9999% of gravitational lensing observed in the universe is created by Eliipticals. The reason being that Ellipticals contain the quantity of star mass that is needed to create lensing that we observe. Sure out of the entire population of Spirals you'll find a tiny percent that will suit your narrative, but among Ellipticals the percentage is vastly higher & it is always about "mass" not DM as you have deluded yourself into believing. "...out of the entire population of Spirals you'll find a tiny percent that will suit your narrative..."
"...why then don't Spirals create gravitational lensing?" "...lack of lensing created by Spirals." "Gravitational lensing does not occur within the vicinity of Spiral galaxies." "...lensing does not occur because the gravitational fields associated with Spiral galaxies does not have the intensity to create lensing conditions." "Gravitational lensing occurs only in association with more the massive Elliptical galaxies..."
So which is it? I didn't see any qualifiers in those earlier statements besides "only". At least I got you to admit that strong gravitational lensing occurs in some spiral galaxies. That's progress, I guess. Jeepers yyz, until I started posting the gravitational data on Elliptical Vs. Spiral galaxies, you didn't even know about it. Or if you did, date the post for us confirming you knew about it. So here it is again, 99.999999% of observed gravitational lensing is caused by Elliptical galaxies. You are just all bent out of shape because you have just been learning data that pokes gaping holes in the DM narrative for which you have been carrying so much water. It is my pleasure to break that water for you, have fun with the new baby. More than any other galactic class, ellipticals exhibit a tremendous range of sizes and masses. The smallest ones, dwarf ellipticals, are merely a few hundred light-years across and aren't much larger than globular clusters. The largest extend hundreds of thousands of light-years from one end to the other and dwarf our own galaxy in comparison. The most massive can contain nearly a trillion stars, or about a thousand times more than the Milky Way.